*The first argument of the font is the font typeface, and the second argument is the font size. You can add a third argument as font style, either bold, italic, underline. 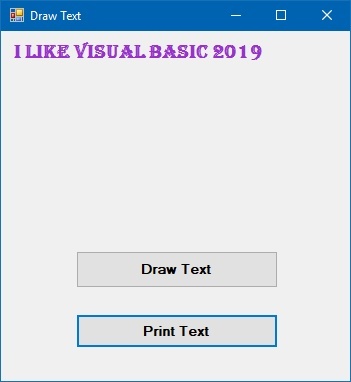 In this example, the program allows the user to enter the text he or she wishes to draw on the form in an InputBox. The text printed on the Form will be dark orchid in color, with typeface Arial, font size 18 and font style underline. You can customize the InputBox by adding additional attributes such as the title, the default text and instruction for the user that prompt the user's action. In this example, we change the Form font typeface to Algerian and font size to 14. The phrase printed on the Form will follow the font properties of the Form. 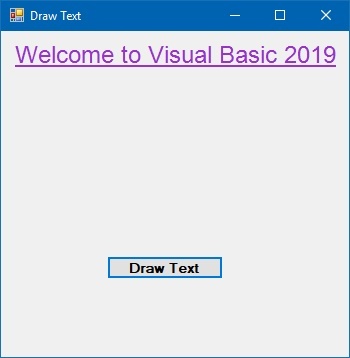 After entering the phrase 'I LIKE VISUAL BASIC 2019' and click OK on the InputBox, the phrase will be printed on the Form,a shown in Figure 29.4.